The name of the station as well as the design is a reference to Futurism and its prominent Russian exponent Vladimir Mayakovsky. 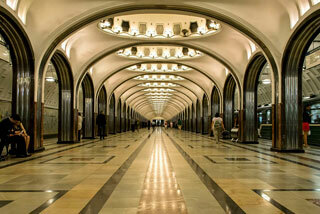 Considered to be one of the most beautiful in the system, it is a fine example of pre-World War II Stalinist Architecture and one of the most famous Metro stations in the world. It is most well known for its 34 ceiling mosaics depicting "24 Hours in the Land of the Soviets." During World War II, it was used as a command post for Moscow's anti-aircraft regiment . This article uses material from the Wikipedia article "Mayakovskaya Metro Station", which is released under the Creative Commons Attribution-Share-Alike 3.0 License.